Few directors have had as much success as Steven Spielberg. His movies have made more money at the box office than any other director and he has handled almost every genre under the sun. He is also underestimated in his technical abilities, probably due to his popularity as often happens. He is actually a very skilled technical director, but is probably loved to such a great extent for his abilities as a storyteller. He has the unique ability to make audiences relate to the characters in his stories and masterfully creates worlds in which we as audiences like to visit. 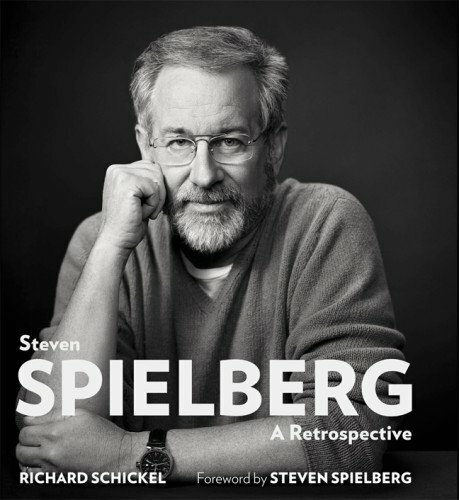 In Richard Schickel’s big, beautiful hardcover book Steven Spielberg: A Retrospective, readers are treated to a concise and lavishly illustrated chronicle of Spielberg’s entire filmography in chronological order. With an endearing and heartfelt forward by Spielberg himself, the book takes on a journey through decades of Spielberg’s films and allows us to not only to see the progression of his career, but also reflect on our experiences as his audience. Oftentimes we can set benchmarks of our own lives by what movies we saw, when we saw them, and who we saw them with. Reading through Steven Spielberg: A Retrospective is a walk down memory lane and a fond one at that. With great content by film critic Schickel for each film and a plethora of over 250 photographs from Spielberg’s films and behind the scenes photos from the Dreamworks archives, this book is one you will pour over time and time again. For fans of film, and especially for fans of Spielberg, Steven Spielberg: A Retrospective is a must own book chronicling the work of the most popular director in movie history. But it is also a diary of some of the best moments we have had in darkened movie theatres as his audiences.